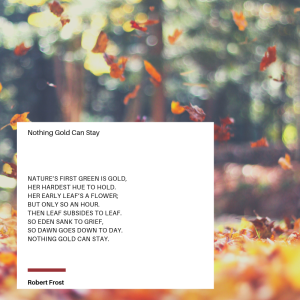 A Robert Frost poem and my favorite A New Found Glory album. All those years go when I discovered both as a high schooler in 2000 (I’m aging myself), I didn’t quite get it. But the other day I was driving home from picking L up at preschool and it hit me. As a mom, you always hear “this is only temporary…it goes so fast.” It was almost like coming up to the surface for air. I realized that the way it is now is not the way it will always be. Each moment comes and then goes, and is gone forever. I pulled into our garage. Both L and Baby A (who is now 6 months – more on her story to come), had fallen asleep. I turned the car engine off and looked in my rear view mirror. I became so acutely aware that this scene will never happen again. Each of life’s scenes comes only once. It is so easy to get caught up in just trying to make it through the day, feeling overwhelmed to do it all again tomorrow. However, each day really is different. I see L in her toddler car seat clutching her puppy dog backpack, shoes off. I feel like she was just like Baby A, I would look at her sleeping face snuggled in her infant carrier through the baby mirror. I will never get this moment again. A wave of what felt like adrenaline poured over me. I got the real sense – perhaps for the very first time – that I will not always be here. That this will not always be my life. Yes, my kids will get older and life will change. That I know. But for the first time, I could feel the lack of permanency in my own life. Someday I will be gone from this life. My biggest question is, will I know how much I miss my kids when I’m gone? My daughter once told me that in a past life she was my mom and I was her baby. I like to think that that is true. That in each life our souls keep finding one another. My sister mentioned to me that an energy therapist had told her that until the age of five, kids are still connected to the other side – whatever that “side” may be. L also told me that when she was a little star in heaven looking down on our family, her cousin Nora came to get her. He argues that children are inherently closer to nature, to where we came from, and that we exist before birth. This same sentiment is echoed in Dr. Wayne Dyer’s book Memories from Heaven. Although I have never read the book – which I plan to do – I have read snippets of stories from it in which children share stories and recollections from heaven, as they say, before they were born. So maybe L is in touch with something for which us adults lose sight. I think after a person experiences loss of any kind but particularly that of a baby, “the miracle” of life is no longer a phrase. You begin to wonder what this life is about and how it comes to be. I look at Baby A in a way I never looked at L. Each hair, each wrinkle, each curve of her ear, each eyelash. All the things that went right to bring her here to me. And maybe that is the point. For all that can go wrong, there are so many times it all goes right. Later that evening, L and I were watching How the Universe Works on the Science Channel – which was her choice. L is obsessed with outer space. She loves naming the planets, asking about the stars and looking for the moon at night. We play rocket ship in my car on the way to school. She says she wants to be an astronaut when she grows up. It was the episode about supernovas. It is believed that our solar system was formed from a star explosion or supernova. In the episode, scientist Michelle Thaller reflects that a cataclysmic end was really just a beginning. Life as we know it was formed from the end of something else. The atoms that make us who we are are the descendants of a star that no longer exists. From destruction, creation. From an end, a beginning. Whether it is these flickering flashes of happiness with two sleeping babies in the backseat, or life in more general terms, nothing gold can stay. And maybe, just maybe, it’s meant to be and better that way.